I'd like to tell you a story today about my Thanksgiving Day in 2003. It was at once the best and the worst Thanksgiving I've ever had. The best, because I found myself marching down Broadway in the 77th annual Macy's Thanksgiving Day Parade, with a crowd of nearly 2.5 million people lining the streets. The worst, because after the parade was over, the streets of mid-town Manhattan were eerily quiet; the sea of humanity that had lined the cavernous streets hours before had all but disappeared, off to their homes for their Thanksgiving feasts. And I was left all alone, hundreds of miles from my family back in Dayton, Ohio, who were celebrating the holiday. There was a reason I was in New York City that day. I was working for the Enquirer at the time; and I was asked to go to the Big Apple with photographer Craig Ruttle because there was an unusual number of Cincinnati-area groups and individuals who had been invited to march in the parade. There was the Miami University Marching Band; and, one of my favorites, the Kings Firecrackers, an amazing jump-rope squad from Kings Local School District, made up of girls in the fourth through eighth grades. The Kings Firecrackers have a national reputation, having performed at halftime in many an NBA arena, on the David Letterman Show, and in presidential inaugural parades. There were also about 40 singers from the Oak Hills High School Varsity Singers who made up part of a massive choral group of high school singers from around the country. And there were pairs of students from Lakota West High and Edgewood High School who were to be part of what was billed as "the world's largest cheerleading club." All told, there were over 300 Cincinnati-area parade marchers making the 2.5 mile journey through the heart of Manhattan on that sunny November day. Craig and I had worked on features on all the locals before heading to New York. We flew in the day before. Craig and I were booked into separate hotels - he had two nights in a Sheraton hotel in mid-town; I had one night booked into the Millennium Hilton directly across the street from Ground Zero, the site of the World Trade Center towers brought down in the 9/11 terrorist attacks. The Millennium had been heavily damaged that day in September 2001, but was rebuilt and up and running only a little more than two years later. I had a room which looked out directly at Ground Zero, which was eerily lit all night, with people passing by constantly to pay their respects. I had the one night in the Millennium and the plan was that I would take over Craig's room in midtown for the second night. He had a rental car and planned to leave after filing photos of the parade, because his family lived only a few hours north of the city. I remember getting up about 3 a.m. on Thanksgiving morning to be able to get up to the Central Park stepping-off point for the parade. I was about to leave the hotel about 4 a.m.; and true to its reputation as the city that never sleeps, they had plenty of coffee and cheese Danish in the lobby so I could grab a quick breakfast. I took the subway to Central Park; and hooked up with Craig. We had several hours to wait before the parade started and we began seeking out the locals, to get an early jump on the story. The parade stepped off on Central Park West at precisely 9 a.m. Craig was racing up and down the parade line, shooting photos of the local groups. We both spent a lot of time at the front of the Miami University Marching Band, walking between the band and the giant float of Garfield the Cat. The marching band had the honor of being the "Santa Band" that year – the one that preceded Santa Claus on his giant sleigh, bringing up the rear of the parade. I was marching down the street, like I was some sort of attraction. It was a great feeling – a great sea of people lined up on the streets and in the grandstands, all waving and cheering. I was wearing a Cincinnati Reds cap; and I was catching some good-natured guff from some of the Mets and Yankees fans in the crowd. Hey buddy, some guy in a Yankees hat yelled, when youse people gonna get a major league ball club in your town? Hey, man, we had one in 1976! He knew exactly what I was talking about. The Big Red Machine swept the pitiful Yankees in four straight games in the 1976 World Series. The guy laughed; and I ran over the to the curb and gave him a big high-five. At the front of the Miami band formation, I walked alongside percussionist T.J. Meloy of Mount Healthy, who helped carry the Miami University banner. What made Meloy unique in the Miami band was that he had been blind since birth. He could never participate in the formations the band did at Miami football games and usually played on the sidelines. But in that Thanksgiving Day straight-ahead parade, he was front and center. "This is great,'' he shouted to me over the noise. "You can feel the excitement. Best feeling ever." Right on, T.J., I said, This is amazing! And it was. It was the most exciting three hours of my career. The experience of a lifetime. And I thought all of the kids marching through Midtown, and the life-long memories being created for them, right then and there. Craig and I peeled off when the Miami Band reached the NBC performing area in Herald Square, where they performed "Parade of the Wooden Soldiers," before moving aside for Santa and his sleigh. We ended up over at Craig's hotel in early afternoon, ordered up some sandwiches from room service. I knocked out my story of the day on the laptop, with a couple of sidebar stories; Craig transmitted a whole bunch of his typically-brilliant photos. I stayed in the hotel room. And then, after the excitement of the parade and the rush of adrenaline of writing and filing the stories, an unpleasant truth occurred to me and changed my mood from sky-high to bottom-of-the-barrel in minutes. The realization that it was Thanksgiving Day and I was all alone. 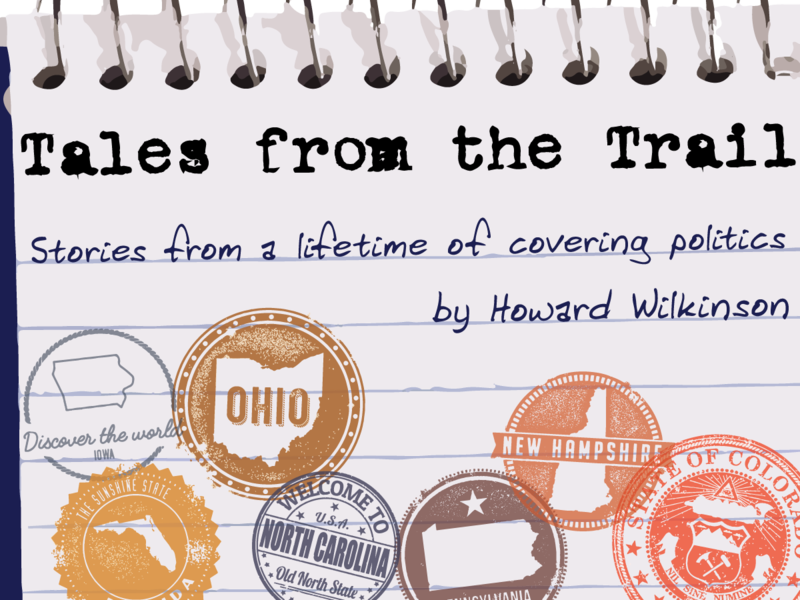 That had only happened once before in my life – in 1976, the only year of my career when I lived outside of Ohio. I was in Carolina Beach, N.C., 15 miles south of Wilmington, where I worked at the time. I didn't like it in 1976; and I didn't like it in 2003. Sitting in the hotel room, I threw myself a little pity party. Finally, I got on the cell phone and called my sister's house. They had just finished the feast – although how they managed without my relish tray I will never know – and they were about to dig into the pies. Pumpkin. Pecan. And my all-time favorite, shoo-fly pie. I'll save you some, my sister said. 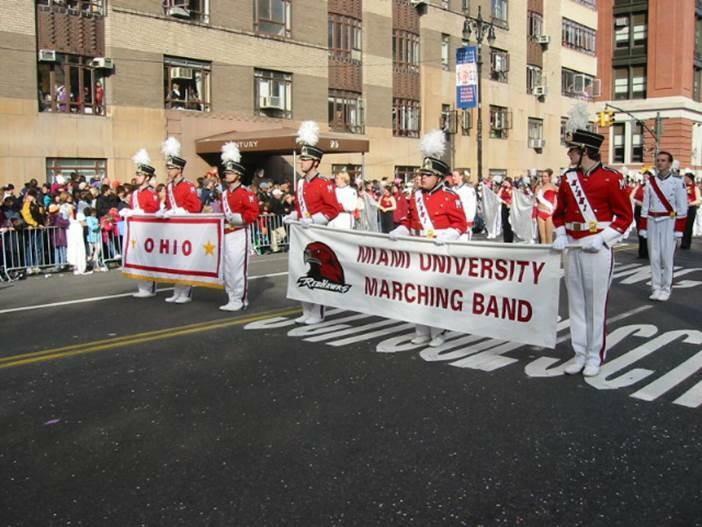 Everybody back in Dayton thought it was very exciting that I had marched in the world's most famous holiday parade. It had been a bright, sunny morning for the parade, but by late afternoon, it had become cloudy and windy. I could no longer stand sitting in the hotel room, watching cable news (which was all full of photos of people having fun with their families on the holiday). So, I decided to go walk around Midtown for a while. Actually, I was foraging, looking for something decent to eat. By this time, I was counting the hours until my flight out of LaGuardia the next morning. I wandered by the Empire State Building, Rockefeller Center, Union Station, and up and down the side streets. I was amazed at how few people were out and about. I turned a corner on to Madison Avenue and I saw a small boutique-style hotel on the corner. Thanksgiving Dinner….Turkey With All The Trimmings…..Come Join Us! Hallelujah! My prayers had been answered! I walked in; the place was nearly empty. The maître 'd greeted me with a cheery, Table for one, sir? I thought to myself, Yeah, a table for one. You see any crowd following me in here? But I just said, yes, and he led me to a nice table for two in the back of the restaurant. The server came by; he took my drink order; and soon delivered an Old-Fashioned and a glass of water. Would you like the Thanksgiving special, sir? Again, I thought something I didn't say: Yes, for Pete's sake, do you think I came in here for a chili dog? Soon, my meal was before me – turkey, real stuffing, mashed potatoes with thick, rich gravy; glazed carrots, fresh peas, a variety of rolls. And, of course, a relish tray! I was enjoying my good fortune when I noticed a family nearby – husband, wife and three kids, who appeared to range in age from six to 16. I started a conversation, asking them where they were from. Turns out they were from Kenosha, Wisconsin; and came for the parade because their high school daughter was part of "the world's largest cheerleading squad." I told them what had brought me to New York City on Thanksgiving Day. And I confessed that I missed my family. Why don't you come over and join us? the father said. The server was more than happy to move my food for me; and I spent the rest of my meal talking and laughing with a family that, a few minutes before, had been total strangers. It was almost like being with my family. Somebody upstairs was looking out for me that day. I hope the same for you this Thanksgiving.